Stephen Shore is an icon of photography, he was only the second living photographer to have a solo show in the Museum of Modern Art – aged 23. An early pioneer of colour photography, Shore was at the pinnacle of the New Colour Movement that was lambasted as gimmicky and without merit when first explored in the late ’60s, early ’70s. 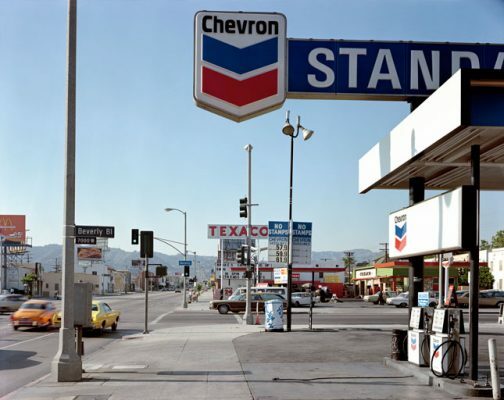 La Brea, his photograph of the Beverly Boulevard and La Brea Avenue intersection, is one of the most iconic photographs of the 20th Century – taken in 1975 aged 27. La Brea became Shore’s defining creation and has dominated his practice ever since. This same all encompassing presence is transferred via a host of other photographers in The La Brea Matrix – a new show presented by The PhotoBookMuseum of Cologne and hosted in Temple Bar’s Gallery of Photography. A conglomerate of Shore’s predecessors, contemporaries and a generation of new photographers influenced by his exploration of all things Americana in Los Angeles and beyond. The centerpiece of the show is the aforementioned La Brea, presented as a double height mesh print in the gallery’s main space. The rest of this room is devoted to a series of prints of La Brea’s use in countless books, as if to shatter any doubt the large print instills of this work’s cultural importance. The beauty of the show is that La Brea, while presented in monumental form, does not over shadow the scion of works that fill the gallery’s other spaces. This is an exhibition that is greater than the sum of its parts. The multitude of photographers and projects successfully avoid being fractured across the gallery, while the video installation upstairs puts context on what the Los Angeles Shore was attempting to, and ultimately successful in, capturing. The show runs until October 11th and it’d be scandalous to miss what is not only an excellently constructed show, but a testament to Shore and La Brea’s importance in the landscape of photography’s history.